Brewing beer and a broken bridge are two things Tadcaster are famous for. But on Saturday, the once-split North Yorkshire market town is intent on redefining itself as host of one of Britain's marquee cycle races. 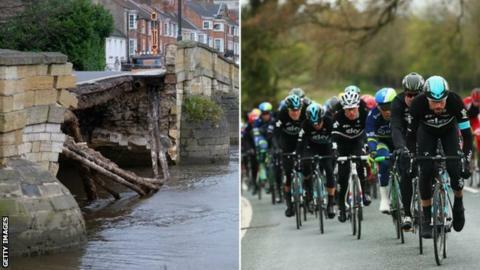 The Tour de Yorkshire women's race and stage two of the men's event will start on the now infamous rebuilt 18th Century bridge over the River Wharfe that partially collapsed following the Boxing Day floods of 2015, which left the town of 6,500 people cut in two to traffic. Some livelihoods were washed away that day, business for others dried up in the 13 months it took to reunite the town as footfall dropped dramatically and a detour of more than 10 miles was needed to reach the other side of the town by road. "For want of a better phrase, we were on our arse," said Kirsty Perkins, a Tadcaster Town councillor. "It was the most awful time." Then the bikes came, with the Tour - which last year generated nearly £60m for the Yorkshire economy - passing through a part of the scarred community off the A64 between Leeds and York in April 2016. While cyclists flew by in a flash of multi-coloured lycra, it was a rare day of enjoyment for "despondent" locals who became all too used to staring at a ruin. "The town was so demoralised, the bridge was nowhere near ready to have work started on it," said Perkins. "It was exciting to witness and gave everyone hope that something like that could come back and we could have a bigger bite of that cherry. "Economically I don't think it had a huge impact on the town at the time as a lot of businesses were still struggling and we were in a period of recovery." When the bikes line up on Saturday, a crowd of 15,000 to 20,000 is expected to descend on the sleepy town desperate to shake off a nightmare. A combined total of 36 women's and men's teams - including nine outfits which race in the Tour de France - will assemble on the Tadcaster bridge for the start of their respective 76-mile races to Harrogate on Saturday. The sight of the world-class ensemble of athletes, which includes Olympic gold medal winner Owain Doull riding for Team Sky and former Women's Tour winner Kirsten Wild, will be an emotional one for some locals. Nicola Eades, whose dental practice on Bridge Street was flooded in 2015 and who is co-ordinator of the town's flood action group, admits the townsfolk have had to deal with a "massive psychological hit". "For 13 months we had a day-to-day reminder of that horrific day in 2015," said Eades. "It is fantastic that the stage is starting on the bridge. Its collapse is a horrific memory for the town and now it will bring everyone together. "We will advertise to the world that we are open for business and that this is an amazing little town." And Eade has called on the devotion of the flood action group again, not to clear out sodden houses or businesses or to man water pumps or lay sand bags, but to help steward the huge crowds around their town, which will also be hosting the Tadcaster Cycling Festival. "We would rather be out for an event like this than at flooding ever again," she added. The bridge was re-opened to traffic in early February 2017 and the town celebrated. Still, some businesses have been lost to the town - insurances, rent and loss of trade were simply too much for some - while others are still in the process of trying to re-establish themselves. With the town about to swell to three times its normal population for one day, Perkins hopes their struggles of the past 16 months can be consigned to history. "The bridge opening was us healing as a community and coming together, and the Tour is us now showcasing ourselves," she said. "What the Tour de Yorkshire does for us is bookend a really difficult time for us as a town." Sir Gary Verity, chief executive of Welcome to Yorkshire, who are joint organisers of the tour alongside French company Amaury Sports Organisation, says he is "immensely proud" of the economic boost that local communities get along the route. "It's great that the Tour has given local residents and businesses something to embrace and look forward to," said Verity. "They've been through a lot over the last few years but hosting the Tour de Yorkshire will herald a new era for the town." In the days leading up to the race, shop fronts have been adorned in blue and yellow - the colours of the Tour - and the cleverly-named 'Tadcrafters' have been busy showcasing their artwork around the area. Zoe Devine's butcher's shop on Bridge Street was flooded in 2015 and it was closed for repairs last year when the race blew through. She now talks of a "bright and cheerful" town. "Last time Tadcaster had such an audience is when the bridge broke, so people will now see us back up and running, we have survived and carried on and we here to stay," Devine told BBC Radio York. John Stainthorpe, whose cycle shop was not damaged in the floods but like many "mucked in to clear the mess", persevered with plans to open a second business last year. "It was one of those situations where, if I could make it work when the bridge was down and the town was on its knees, then I could make it work when it was repaired," he said. As a cycle shop owner, who was selling bikes in his father's business at the age of eight, and a huge fan of the sport, Stainthorpe says it is a "dream come true" for the town to get a much-needed lift from a cycle event that is televised in more than 170 countries and was last year watched by some 11.4 million viewers worldwide. "We can be famous for all the right reasons," said Stainthorpe. "We won't just be the town that got its bridge smashed in - Tadcaster was a host town for the Tour de Yorkshire." "There's a real sense of the community coming together in Tadcaster. "The town's had a tough time of it over the past year and a bit - literally being torn in two when its bridge collapsed into the river during the devastating Boxing Day storm of 2015. "Just weeks ago the town was reunited with the opening of its new bridge and local businesses say that they can't wait to show it off to the thousands who'll flock to the town for day two of the Tour. "The phrase I'm hearing over and over again is 'it'll be nice to be known for something other than a broken bridge'. "There's a tangible sense of excitement building and we now know that, after the big bridge re-opening, something that Tadcaster can do well is organise a party!"